Last week I was sitting in my parents living room in Louisville, KY watching a morning news show with them when we saw a news story on a very little know National Park, The Isle Royale. Now my parents are older and have physical restraints but after watching that show, I decided to leave for a visit of Isle Royale. The Isle Royale in an island in the middle of Lake Superior almost in Canada. It has ferries in Michigan and in Minnesota that carry visitors to the island. I opted to ride up the Minnesota side and that was an extra treat. 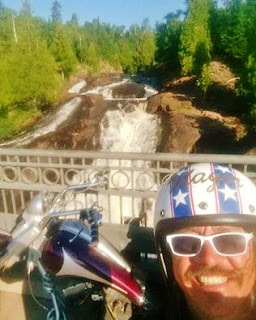 The ride up Minnesota Hwy 61 is called North Shore and it is epic. I'm not the only biker that knows about it as I saw groups of 10 and more bikes everywhere I looked. I had no idea it was there but plan another ride on that next time I am near. North Shore runs from Duluth all the way up to the border of Canada and is on the shoreline of Lake Superior. You owe it to yourself to check it out if you haven't already. I always carry a tent and sleeping bag and with all the hotels and cabins with no vacancy signs I was glad. I checked a few campgrounds and even the tent space was full. I prefer " primitive" camping so I spotted a For Sale sign on a property with an over grown drive way and it was perfect. The even higher weeds in the back provided excellent camouflage for my bike and tent so no one knew I was there and I got and evening of undisturbed sleep plus the high weeds under the tent made nice padding. But getting back to The Isle Royale, it is home to over 1300 moose. The visitors center had this cool skeleton. I saw a pair of moose swimming in the water and then walking on the shore line. Can you believe it, the one time I didn't have my camera. Dockside sushi was provided by some local fisherman that caught a large salmon and a steel head. The harbor is also the final resting spot for The "America". The America is a 184 foot steamship that hit a reef and sank in in 1928 here at Isle Royale. The tip of the bow is only 3 foot deep as you can see the bow here but the rest of the ship continues deeper with the stern 80 foot deep. It is an excellent dive destination and since I am a certified diver, I might have to give this a look next visit. 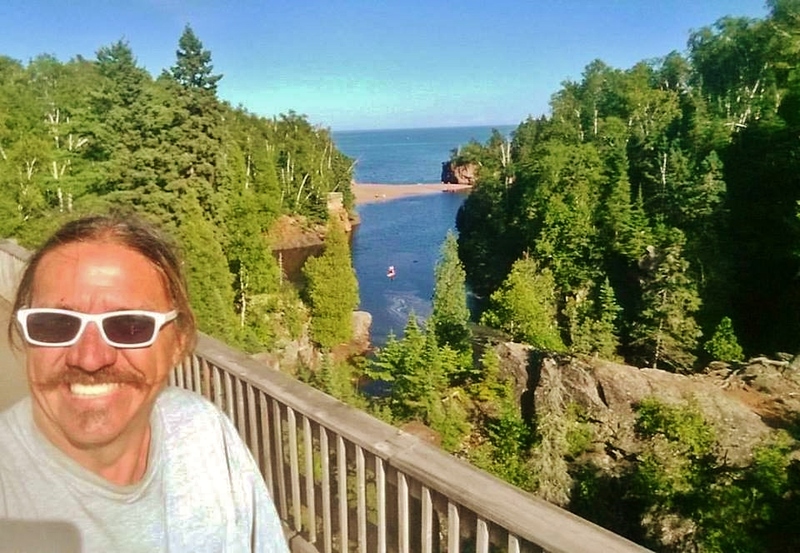 I so enjoyed seeing the pics Bean're as I used to live in Meadowlands, (40+ miles from Duluth) I haven't been back home in that area for about 10 years and remember so much the drives a friend and I would take up the North Shore! I always loved the Split Rock light house area! Thanks for sharing! I miss the beauty of it all!